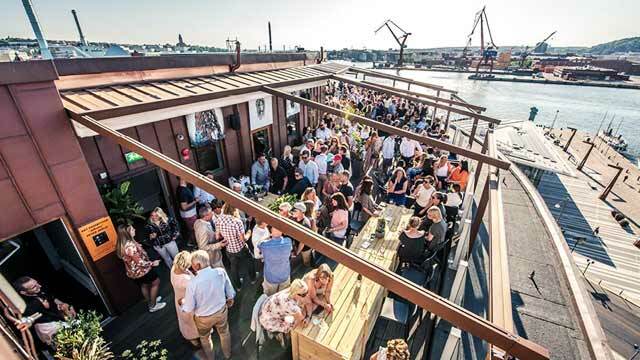 A complete guide to the 6 best rooftop bars in Gothenburg in 2019. Which are the best rooftops in Gothenburg? 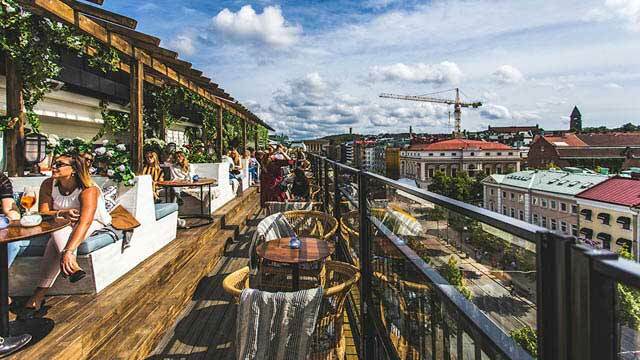 On this list you'll find the best Gothenburg rooftop bars with all info you need about each terrace. Opening hours, dress code, pictures, information maps and much more. 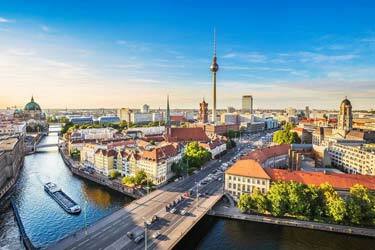 A superb rooftop city during the summer months from April – September. You will find both small and cozy rooftops to bigger and more luxurious ones. 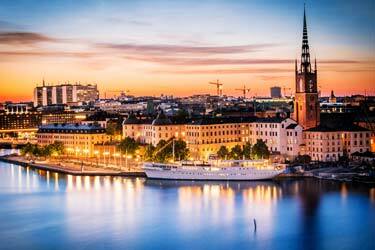 In other words – Gothenburg is a fine rooftop city in Sweden. 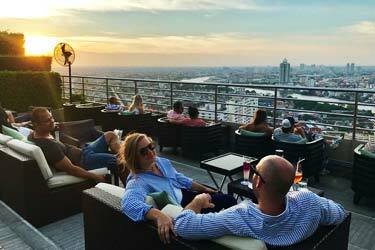 So, which is the best rooftop bar in Gothenburg? 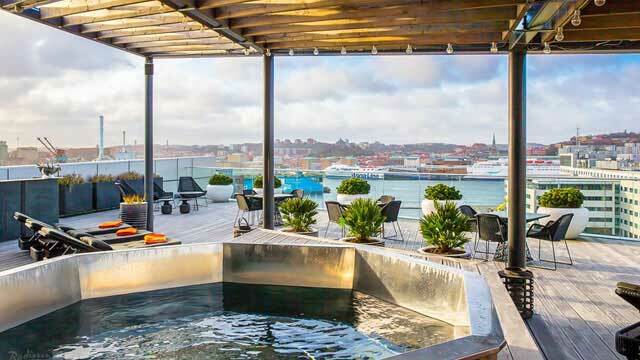 Scroll down and find the Gothenburg rooftop bar best suited for you. Or use the Gothenburg rooftop map in the bottom right corner. 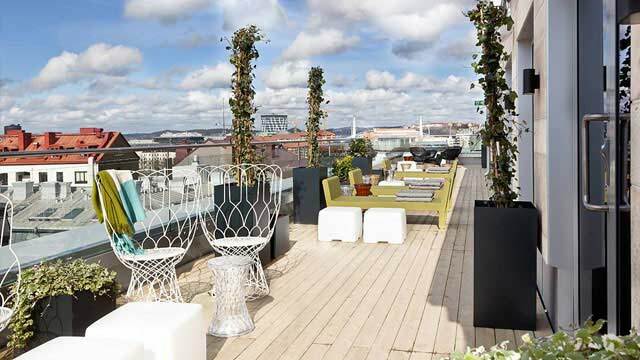 This rooftop bar is located on the 7th floor of the hotel Scandic Rubinen in central Gothenburg, right on the most famous street called Avenyn. 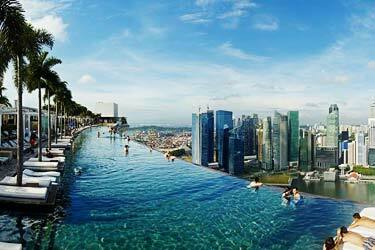 From the terrace you get a magical view over the city rooftops and down on the buzzing streets. Up here focus is on drinks, with skilled bartenders preparing seasonal crafted cocktails. There is also a good selection of beers on draught, wine and bubbles. A great choice for some summer evening cocktails, but with both an indoor lounge along with blankets, awnings and infrared available on the terrace, it is also a great winter destination. The latest addition to the rooftop scene in Gothenburg, found up on the 7th floor of Comfort Hotel Gothenburg. Located right by the water, and the views you get over the river Göta Älv are absolutely amazing. 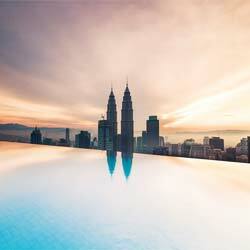 But TaKeT offers much more than just grand views. 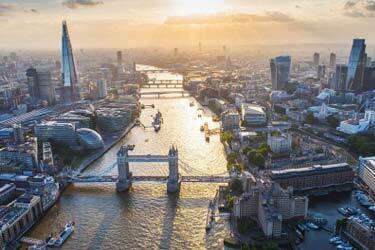 Usually there are different events like DJ sessions, exhibitions, rooftop yoga or brewery takeovers. Events or not, the atmosphere is always friendly and relaxing, with a cool vibe but inviting to all. Open and airy feel on the terrace, an the bar offers a nice selection of well made cocktails, wines and beer on tap / bottle. 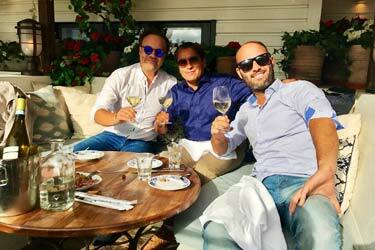 In the middle of Gothenburg's main street Avenyn, you will find the lifestyle hotel Bellora with Cielo Rooftop Bar. Up on the 7th floor you find a lovely view of the Gothenburg skyline where you can enjoy the sunshine, margaritas, a cosmopolitan feel and soft music, often presented by a live DJ. Apart from margaritas, the Cielo rooftop bar serves a nice selction of well made cocktails, beer and wine, along with cheese, charcuterie and pizza to keep the stomach happy. Choose to sit at one of the smaller tables close to the edge, or cuddle up in the roof covered large lounge sofas a few steps up. A lovely little Gothenburg rooftop bar and the perfect destination if you are looking for a classic pub combined with a rooftop terrace. John Scott is located in central Gothenburg, and occupies all three three floors of a classic building. Here you can get the full pub experience year round, watching sports, join in on a quiz, catch a live act or just socialize. When the weather is nice you can head up to the 3rd floor terrace and enjoy a relaxed, sunny and friendly atmosphere. The menu is classic pub style, with items like burgers and 28 different beers and ciders on draught. 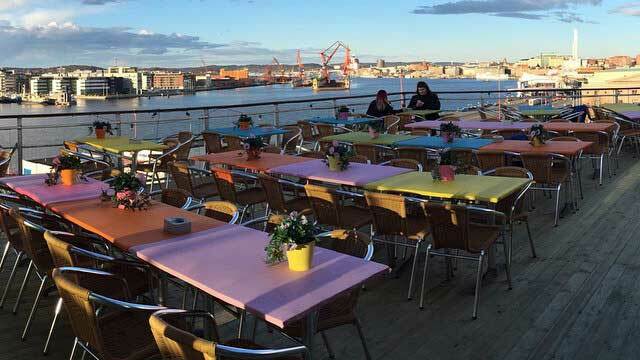 On the roof of the Radisson Blu Riverside Hotel Gothenburg you’ll find this lovely and harmonious rooftop bar with views over the city and the surrounding water. Decorated as a relaxation area with a hot tub, decking and sunbeds - but also with regular tables and chairs. 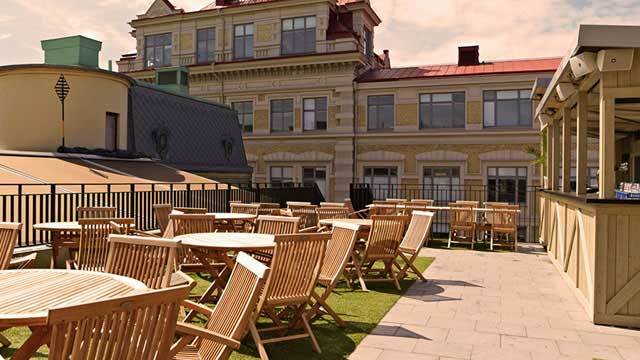 The terrace is free for hotel guests year round, but anyone can enjoy the rooftop and all the facilities for a fee of 300 / 400 SEK depending on day. During the summer months there are also occasional BBQs and other rooftop events, free and open for all. Like the 'Sunny Thursday's, now also on Fridays', an after work event every Thursday and Friday from 4pm. Henriksbergs rooftop bar offers one of Gothenburg's best views, over the river and towards Lindholmen on the other side. 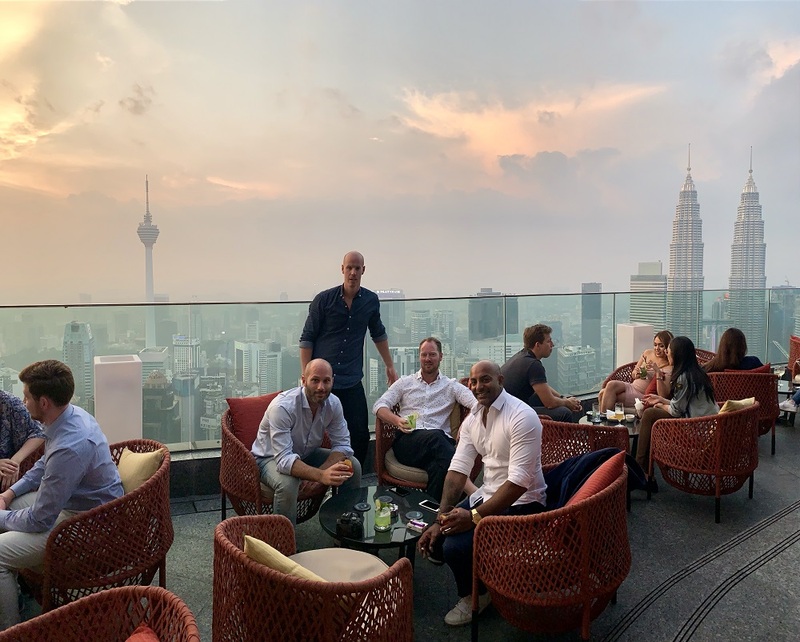 Founded allready in 1894, it used to be a fine dining restaurant, but nowadays it is more towards a youthful pub / club in a three story building, where you can enjoy conserts, quiz, stand up shows, whatch sports, play pool and much more. 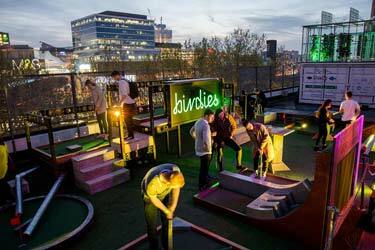 And of course, enjoy yourself on the rooftop terrace. The atmosphere is friendly, realaxing and usually quite lively. It's advisable to drink a couple of beers from the large selection and eat something from the summer grill menu. Discover the biggest collection of Gothenburg activities, guided tours and skip-the-line tickets. Anything you want you'll find right here. There are not that many rooftop bars in Gothenburg. But those you can find often have good views of the city and its rooftops. Because of the cold climate, the rooftop bars here are only open from about April to October. Dispite the cold climte you'll find some really cool sky lounges in this coastal city in Sweden. Most of them located at hotels. Gothenburg is Sweden's second largest city. 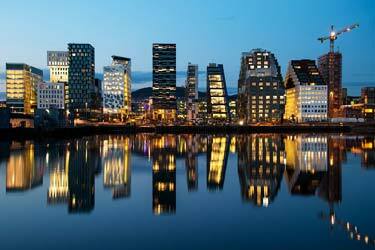 The city is located on the west coast and has the largest harbor in Scandinavia. This results in that this is Sweden's most important city in terms of imports and exports to and from other countries. Every year the world's largest youth tournament in soccer Gothia Cup takes place here one week in July. Other attractions in the city is otherwise Feskekyrkan, the Tivoli Liseberg and the shopping street Avenue. The climate here means cold winters and hot summers.